GitHub - sarfraznawaz2005/floyer: Floyer is simple and fast deployment tool using git/svn and (S)FTP - especially useful for shared hosting. 🚀 Floyer is simple and fast deployment tool using git/svn and (S)FTP - especially useful for shared hosting. Want to be notified of new releases in sarfraznawaz2005/floyer? This tool is not fully tested, use it at your own risk! Floyer is simple and fast deployment tool using git/svn and (S)FTP - especially useful for shared hosting. 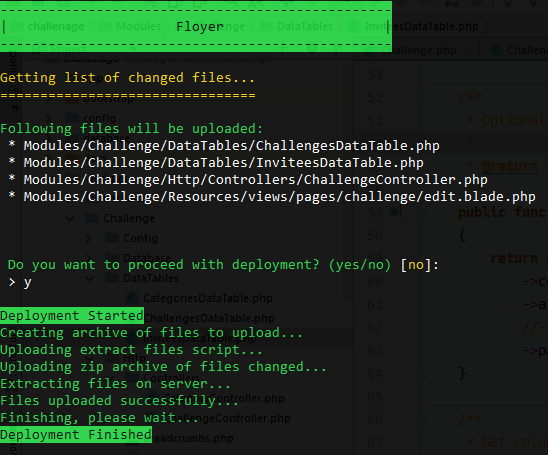 To run deployment, just type this on terminal: php floyer deploy ini_file_to_use. See below for commands. php floyer deploy ini_file_to_use --sync : Synchronize last local revision id with remote revision file. php floyer deploy ini_file_to_use --history : List files deployed in previous deployment. php floyer deploy ini_file_to_use --rollback : Rollback previous deployment. Note Because these ini config file contain server connection details, make sure to gitignore them in your project. It stores revision/commit hash on the server in a file when deployment is started. On next deployment, it compares local revision with remote one thereby able to deploy only the files changed between these two revisions. Once it knows what files to upload, it creates zip archive of these files to be deployed on the server. Rather than uploading each file individually (which is very slow process), it creates and uploads zip archive file to server where there is corresponding extract zip PHP script which extracts these files very fast. This script is also created and uploaded by Floyer. After deployment is finished, zip archive and extract script is deleted automatically. Deploying by uploading and extracting archive file not only makes deployment fast but also we don't have to worry about some permission issues or creating new directories and so on because extract script runs from server itself thereby avoiding these issues. However, you can still use ini_file_to_use argument if you wish to upload to differnt server.